In early January of 2011 Intel released its new Sandy Bridge series or 2nd generation of “i” series processors. These CPU boasted the new 32nm lithography that both performance enthusiasts and gaming fans alike had been waiting for. New motherboards with 1155 pins were made to accommodate Intel’s new technology. In order to use the new Sandy Bridge i3, i5, and i7 CPU you’ll need a LGA (land grid array) 1155 motherboard in combo with your CPU. In late February of 2011 Intel sent out a press release stating that they were having problem with their Cougar Point chipset technology which was causing problems over time in the performance of PC peripherals including the SATA hard-disk drive or optical drive. Luckily this was promptly fixed and REV 3.0 or B3 revision motherboards were shipped out immediately. Still, consumers will want to make sure to purchase their motherboard from a trusted retailer in order to ensure that they get a proper revised motherboard. *Look for the sticker on the box and check the bios to make sure you get the B3 revision. 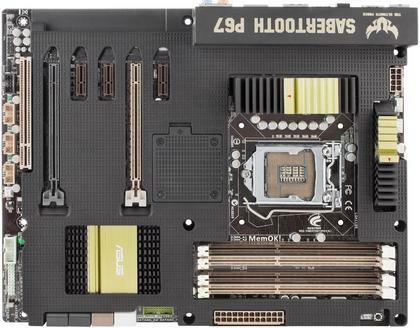 Here’s a list of our top rated and bestselling 1155 motherboards for 2012 which include motherboards from reliable and durable brands like Asus and Gigabyte. The p8p67 Deluxe gives you plenty of options for all of your peripherals at all the newest levels of technical specifications including Sata 6Gb/s, USB 3.0, and DDR3 Ram at the 1866/ 1800/ 1600/ 1333/ 1066 speeds. System Level Energy Saving and Real-time Power Management. Anti-Surge ProtectionSafeguard your device by providing voltage protection. Two simple ways to get quick free graphics upgrade. Quickly ensures memory boot compatibility with a mere push of a button. EFI BIOS control via a Graphical Interface with mouse controlled support featuring unparalleled control options. ASUS offers this platform-leading solution with the exclusive Dual Intelligent Processor. The Asus Sabertooth P67 has come down in price considerably from its release of just a couple months ago. We think it’s a great buy at right around $200. ASUS E.S.P. (Efficient Switching Power) offers not only More switching power and Higher efficiency for the motherboard. DIGI+ VRM New Era of Digital Power Design that fully enables Superior System Stability. System Level Energy Saving and Real-time Power Management for Superb Platform Power Efficiency. Increase Platform Performance Instantly with Self Optimized Settings while retaining Full System Stability. RC Bluetooth Experience the new revolution of overclocking on your smart phone! DIGI+ VRMHerald the Arrival of a New Digital Power Design Era TUF Thermal Armor. Intel Gb LAN High-Performance, High-Bandwidth Data Transfers. UEFI BIOS BIOS control via a Graphical Interface with mouse controlled support featuring unparalleled control options. TUF Thermal Radar A Complete Thermal Control SolutionTUF Components. ASUS E.S.P. (Efficient Switching Power) offers not only More switching power. Anti-Surge Protection – Safeguard your device by providing voltage protection. EFI – BIOS control via a Graphical Interface with mouse controlled support featuring unparalleled control options. EPU – System Level Energy Saving & Real-time Power Management. 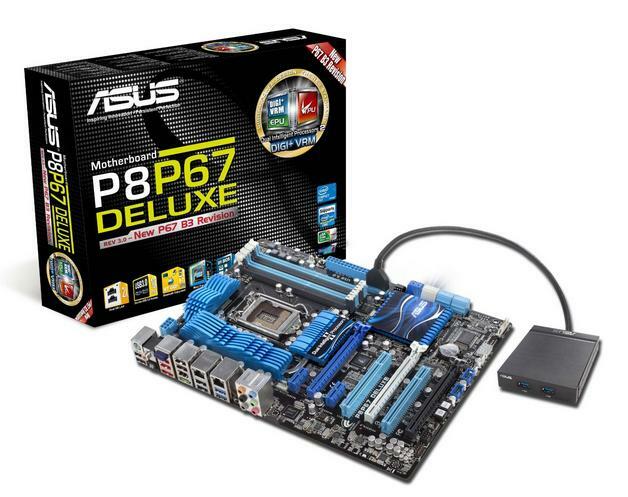 Our choice for best 1155 motherboard CPUcombo is the ASUS P8P67 DELUXE LGA 1155 2400 ATX Motherboard with Intel’s new 2600k CPU. You can see our CPU/Processors tab above for additional CPU ideas.